Librarian Megan Clark has written about 250 compliments and placed them in a jar at the library. Like a fortune cookie, the random compliments take on new meaning when they're read by a particular person at a particular moment. Editor's note: After publishing this story, we learned that the author is friends with Megan Clark. That is a conflict of interest, and therefore this story does not adhere to CBC's Journalistic Standards and Practices. We are satisfied that the story itself is accurate. Fourteen year-old Mohaned Babkier puts down his Luke Cage comic to take a slip of paper out of a jar at the Yellowknife Public Library. Reading it out loud in unfamiliar English, he smiles. "It's nice having you around," he says. The text on the paper is just one of around 250 compliments written up by librarian Megan Clark and folded up for library patrons to take and read. "I feel like it's one of my most successful programs," she laughs. 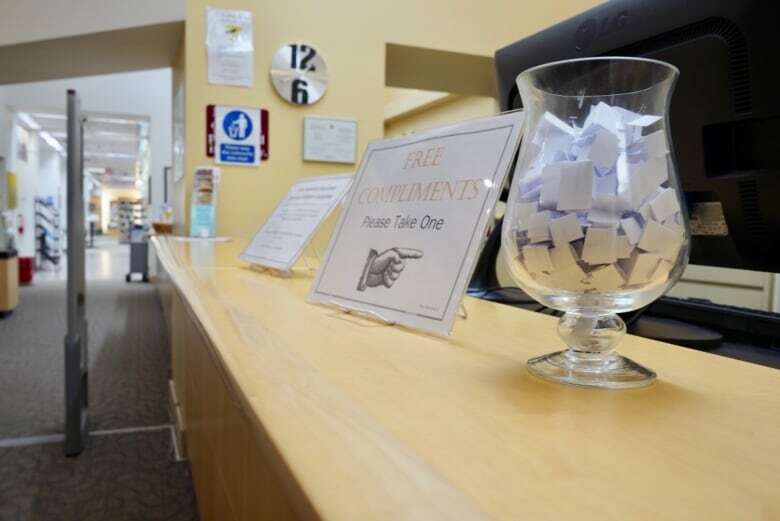 Originally intended as a fun novelty for National Compliment Day in January, Clark's jar of compliments by the front entrance was soon in high demand. When she tried to take the jar down at the end of the week, people rebelled. Today, she finds herself filling the compliment jar several times per week, with phrases like "You are worthy of time and attention;" "That colour is perfect on you;" and "You have a great sense of humour." The reactions have at times been dramatic. 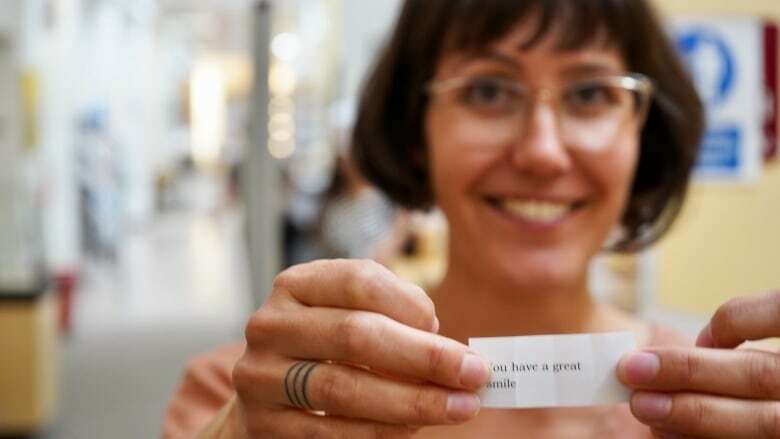 Like the paper tucked into a fortune cookie, the random compliments take on new meaning when they're read by a particular person at a particular moment. One patron who was going through a particularly rough patch pulled out a compliment that read "You are strong" — exactly what she needed to hear at that time, says Clark. Through tears, the woman repeated it aloud: "I am strong." Clark says there are patrons who take several compliments per day. Some take them discreetly to read on their own, while others read them to each other, or leave them propped up for others to find. Clark admits that even she, the author of the compliments, will occasionally take one for herself. "It is the most ridiculous for me to write a compliment, then at a later date go in and pick it out and feel good," she says. "But I do feel good. Because kind words feel good." She says the program's popularity offers insight into the role of the public library. "I think it says people need and deserve an open public space where they can be themselves, whoever that is, and they're not a consumer but a citizen, and that when they come into that space, not only are they welcome, but they belong there," she says. "Everyone belongs equally to that space, in the same way that everyone deserves, equally, a kind word."